Log cabin in the woods of the North Georgia Mountains ----- We call it 'A SIMPLE LIFE'. Pay via On Line Booking or via Check. Quiet & private property situated on 2 acres, located in log cabin community on Sunrise Mountain. Other cabins are on 2 acre lots that can only be seen from the road - you will have lots of privacy, yet not be isolated. Open with high ceilings in living room. Wood floors, walls, and ceilings with ceiling fans. Fireplace. First floor has master bedroom with queen-size bed (with great view to outdoors) and full bathroom. First floor also has second bedroom with twin beds (can be brought together) and a second full bath. Upstairs is a large loft with two twin beds. There is also a sleeper sofa in the living room. Full width SCREENED porch with porch swing and rocking chairs overlooking woods and mountains (beautiful sunsets) -- year-round view. Relax in the hammock. Pets are NOT allowed, No Smoking inside. Nice Campfire area near cabin, with 2 level tent sites - fun for the kids or parents who want a convenient camping experience. Our twin boys love camping with dad, while mom is happy to read a book on the screened in porch swing. Minutes away are many outdoors activities (rafting, tubing, hiking, zip-lining, Blue Ridge Lake & beach) and you'll also enjoy the quaint town square with lots of antique/gift shops, tea room, candy/ice cream parlor, etc. Lots of Great new restaurants! Therapeutic Sundance hot tub for 5-6 persons has colored lights. Spa is on large deck also equipped with outdoor grill & very large wood dining table! Last 1/2 mile is a well maintained and not dangerous gravel road with 2 ways to the cabin. Most every vehicle can handle the last steep stretch, 4WD is NOT needed (we have a minivan) but an extremely lightweight or underpowered car is not recommended. more family photos can be seen in our cabin! Easy to get to from Atlanta, popular with Florida and Georgia guests, the cleanest lake in Georgia, close to town, very quaint town with neat shops and lots of things to do, VERY RELAXING. Read our Reviews! Facing Rolling Mountain View with Sunsets. View from Hot tub. Some pantry items, available for your optional use. Well equipped with Dishes, Pots & Pans, Cooking utensils, Glasses, and we allow our cleaner to leave salt, pepper, oils, condiments, and other food items for your optional use. Seats 4 (standard) and pull up 2 more chairs for comfortable seating of 6. Screened deck with Rocking chairs & Porch Swing. Large side deck with Hot Tub and View! Large table on deck seats 8-10. Luxury Sundance hot tub - 34 jets, 5-6 people. The Certa model from the 780 Series offers healing hydrotherapy that can help you feel good as the years roll by - promoting better sleep, and easing muscle and joint stiffness. Its Accu-Ssage™ Therapy Seat gets at the critical areas that need attention by targeting sensitive pressure points in your back, neck and shoulders. Other jets in the Certa target calf muscles or the feet. Every seat in the Certa puts you in a position to enjoy the anti-stress, anti-aging benefits of a Sundance. Lovely place, great view ,clean- would definatly recommend to others! Awesome little quiet cabin in the woods!! We chose this cabin as a family New Years Eve stay, and we were more than happy with our experience. The cabin was just far enough away from neighbors that you felt like you were all alone in the mountains! It was well supplied with everything we needed as well. 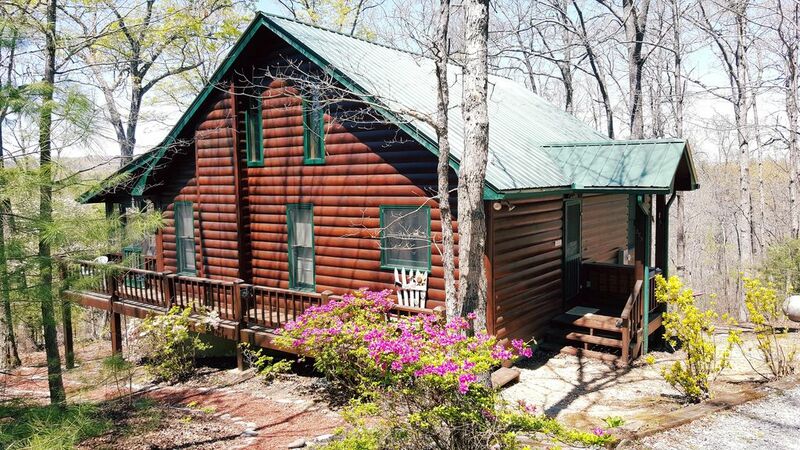 I would recommend this cabin to anyone who wanted a nice quiet getaway! It was clean, cozy, and nice! We loved the view!! Nice cabin! Overall, a very nice property in a good location. We enjoyed our stay. Although pretty minor, some of the household items are quite dated or not working properly and need replacement, eg, shower head, coffee maker, ice maker. The access road is steep, but fine for front-wheel drive vehicles in dry weather. However, it may be problematic if conditions are slick or icy. Glad you enjoyed your stay! We will examine shower head and coffee maker which had been working fine and promptly replace if needed. Lowest rates on non-holiday Mon-Wed nights 2 Night Rates sometimes available @$159/Nt (weeknight) or @$169/Nt (weekend) rates, ON-LINE quote will not work 3 Night Special works with ON-LINE quotes Some fees are removed if paying via Check, please inquire. $250 deposit is due to Reserve Dates - if using VRBO for payment they add a Service (booking fee) to this Balance is due 15 days before arrival, Full Payment is due if within 15 days. No one under age 25 may rent without discussing with owner, submitting additional security deposit, and no more than 4 persons. Holiday periods @$159/nt, Christmas/New Years periods @ $169/nt CANCELLATION POLICY: Travelers who cancel at least 60 days before check-in will get back 100% of the amount they've paid. If they cancel between 30 and 60 days before check-in, they'll get back 50%. Otherwise, no refund is guaranteed. Any payment made for rental constitutes acceptance of our Cancellation policy. No refunds for early departures. No refunds for anything believed to be misrepresented on this site.